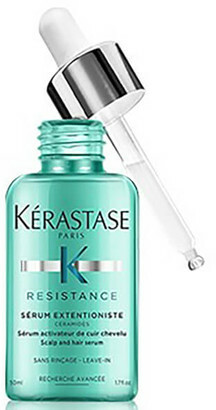 Strengthen and protect strands with the KÃ©rastase Resistance Serum Extentioniste , a nourishing leave-in hair serum that helps to protect against breakage. The non-greasy formula uses a host of powerful ceramides to seal the hair cuticle whilst a blend of lipids creates a smooth surface, creating a fortifying effect from the inside out. The highly concentrated serum forms a defensive barrier over the scalp to protect against damaging environmental aggressors, whilst also sweeping away impurities for a fresh appearance. Hair will be boosted, revitalised and given improved resistance.